ISPM and the Bern University of Applied Sciences received the 2016 health literacy prize from Allianz Gesundheitskompetenz at the national health promotion conference in Neuchâtel in January 2017. 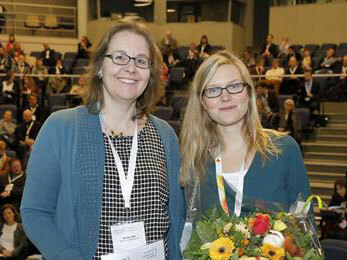 Accepting the CHF 13,000 main prize were Corinna Krause of ISPM (pictured right) and Sandra Jent from BFH (pictured left). The workplace intervention trial “salt consumption” is one of six projects making up the National Research Program “Healthy nutrition and sustainable food production” (NRP 69). NRP 69 is investigating the link between today’s predominant diseases and nutrition. It aims to develop scientific bases and practical approaches for promoting public health through diet and to make the food production chain more sustainable.